Thursday we ran the Terrapin 5K as part of DrDrea's wedding week ramp up. We did a 5K the Sunday before our wedding and DrDrea wanted to do the same thing. Unfortunately, 5K is about the only thing the two events had in common. ﻿ DrDrea had a lot of last minute issues (surprise) come up before her wedding so she was stressed. Mr Massage and a few other random people I know also happened to be there. As for the race itself I did fairly and averaged sub 8 mm, which is something I haven't done since my peak running years. I have been taking it easy this week because of last Saturday's not so good Long Run. It was supposed to be 13 miles and since I was needing to walk before the halfway point, I dropped out at mile 10 and took a cab back to the site. So I only did one run on the treadmill earlier this week and the 5K on Thursday. Today's LR is a cutback and since I'm doing a reading at DrDrea's wedding, I figured I'd exercise one of my excused absenses and not group lead today. I will try to get out tomorrow morning when the temp goes back to normal and work off the wine and wedding cake. Registration - In order to sign Nightingale and me up, I had to go through the registration process twice. You'd expect this in 1999, but in 2013, most sites have a register another person button all coded up. 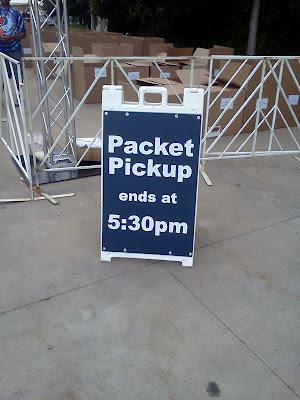 Packet Pickup: Mostly my fault for not getting our gear sooner, it might have saved some stress. They did have race day pick up which is fantastic. However, they only had a small window from 2 - 5:30 to pick it up. Most people work until 5 so I was lucky that I WFH and was able to leave early to get our stuff. Course: Standard 5k course going south of Soldier Field through the tunnel at McCormick Center along the lake front. For a hot day it seemed ill equiped water wise on the course itself. And since it was a really hot day, they lacked water before the race and ran out for the slower finishers at the end. Post Race Party: They gave us a dougnut and a fake cheese quasi-qasidilla that was terrible and we didn't eat. Only give one drink ticket. That's not terrible in and of itself but with the amount of people, it just wasn't worth it to buy more drink tickets and wait in those long lines. Swag: I like the goodie bag simlpy a dry-fit vintage concert T-shirt and a gear bag. Unfortunately, I think this event was tainted a little before it even began and all its flaws certainly didn't help make an arguement for doing it again. I was more than a little pissed off that DrDrea didn't think to pick up our packets when she got hers. I know she has a lot on her mind with the wedding but this was her idea and I got everyone's packets last year at our wedding 5K. We met up for a few minutes after the race but I was never able to get Nightingale and her in the same space. By the time she answered my last text, we had decided to get going since we had to be at work the next day.